This tutorial uses the popular fontawesome iconfont to create animated checkbox inputs using CSS3 transitions. The nice thing is that one doesn't have to create custom graphics in Photoshop for it. Pseudo elements are used on labels to place two icons(checked and unchecked) one above the other using absolute positioning. 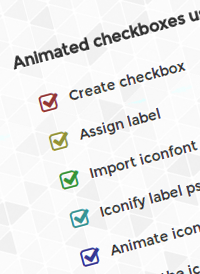 When the user clicks on the label, the checked icon animates in/out. To simulate real handwritten ticking/unticking, the checked icon's visibility is revealed from left to right using max-width transition. Awesome man you always exceed my imagination. Dude, the world needs more people like you! Why the code after writing is not working in Latest Firefox update??? It is working on live demo but after writing the same code by myself.. it is not working in Firefox? ?plz explain?? John : Now its working ? I mean how? Man, this is so cool, I can’t even pick up words! I did coding for myself, but the idea of stretching “image mask” from the side is awesome! It looks like a real jackdaw so much, so there is straight association with puting it down with a physical pen or pencil. Thank you again! The most CCTV cameras in use today usually are for surveillance and security purposes. publications including Men’s Health, Yachting Monthly, The Observer, the Daily Mail and also the Sunday Times. The nice thing about it, is when you’re willing to look into used cameras you can find plenty of great deals. it illustrates who has the political power in an organization’and who doesn’t. to defy this perception is tougher than one can imagine. There has always been Hollywood gossip in the press. that like to watch online on their computers.